The museum of Civil War Tails is located in the dormitories of the National Soldiers Orphans Homestead, which was founded to care for the orphans of Civil War battlefield soldiers in 1866. The dormitory building was added in 1869. 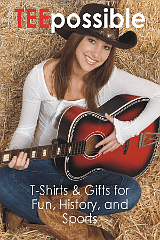 T-Shirts and Gifts for Fun, Sports, and History. On this page we're going to Spotlight the lesser known historic sites and attractions that dot the history landscape across the USA and are worth a visit if you're in their area. And while they may be lesser known, some are very unique, and will be that rare find. You'll be, at times, on the ground floor, or maybe even know something others don't. It'll be fun. Visit them. It's so unique. It's so interesting. It's so hard to believe and hard to describe and hard to stop smiling when you think about it. It's the newest museum in Gettysburg in a historic location with an americana touch on the history of the battle combined with, ... yes, soldier cats. 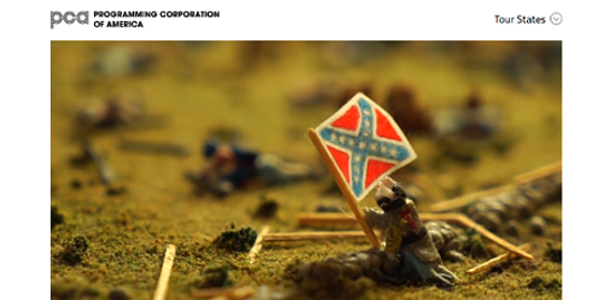 This is a museum that not only shows the vistas of the Gettysburg battle in diorama form for those who already know of those famous sites (Pickett's Charge, Little Round Top), but gets the young engaged in history in such a creative way, they won't even know why they've started to love it. In a small and creative space, all within the walls of the history of the dormitory annex of the National Soldiers Orphans Homestead, there's a new museum with such a creative bent, it's hard to imagine the imagination of the designers and their quiche americana approach to history. But don't mistake the tails on the edge of the soldiers who represent Joshua Chamberlain or General Armistead as anything but that unique take on the representation of the battle. These dioramas are painstaking portraits of the actual scenes with six thousand (and counting) figurines, hand-made, with a whole lot of accurate fun. Your kids are going to love it and you're about to smile. This museum understands that history can be fun, that to engage the delight of those with less of a historic seriousness than the avid reenactor, you have to pull interest from all places. If that's cat videos, or cat dioramas, or feline figures of the famous, so be it. And we agree. This is one of those few museums that you'll talk about when you go home and that the younger folks in your entourage of "are we there yet" travelers won't be hankering to rush back to the motel pool to get away from. What you have there now are representations of several of the key moments on the field, including Pickett's Charge around the High Water Mark and the Angle, Devil's Den, and Little Round Top. There are also dioramas of other points of interest in the Civil War, including Fort Sumter. Spaced around the museum are photographs of Civil War scenes as well, plus some photographs of the building it's housed in; the former National Soldiers Orphans Homestead that was built to care for the widows and orphans of the battles. That task began in 1866 (this building built as an addition in 1869). How famous was this homestead location in that task? 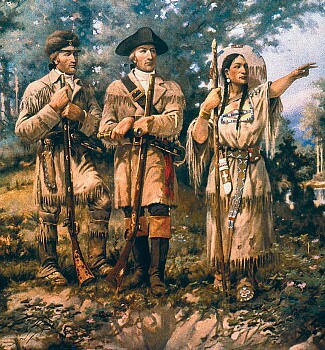 General Ulysses S. Grant visited it. So when you're in Gettysburg on a rainy day or warm walk around night waiting for a ghost tour to start, walk up Baltimore Street, get an ice cream cone, and take in a catastic museum that will teach and amuse in such a wonderful fashion, you might just start taking a class on art and dioramas, or buy a second cat. Have fun. Learn history. Build a better mousetrap. Smile. We get the feeling that a visit to Civil War Tails might just help you with a few of those. 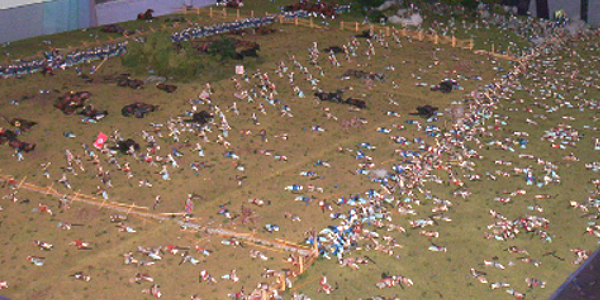 Photo above: Diorama of Meade's Headquarters at the Battle of Gettysburg. In case you didn't think this museum and its unique take on Civil War history could get even more engaging, now there's a book telling the stories of the cat soldiers. And while the premise may be to help you understand the genesis of the idea, how the dioramas are made, and the wonderful photographs of all, it's actually in the concise and historic descriptions of the battles which the dioramas represent where Ruth and Rebecca Brown tell these stories that have you wanting more. Yes, you will get emotional as you read this, and you will certainly smile that the world still builds people who can make you do both. Congrats, you Browns. You've done it again. 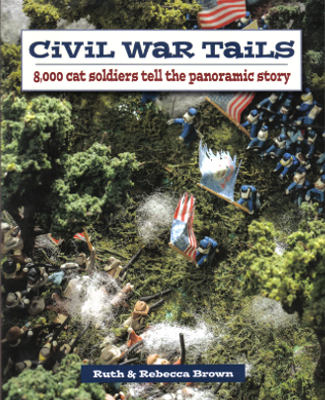 Civil War Tails at the Homestead Diorama Museum is located at 785 Baltimore Street. From the center of town, follow the signs to the Gettysburg National Military Park Visitor Center. Once Baltimore Street takes a slight turn to the left, the museum will be about two blocks up on your right hand side. It is directly across from the Gettysburg Tour Center. If you're coming from the south off Route 15 onto Baltimore Street, you would pass the Visitor Center and continue about one half mile; the museum would be on your left. One of the most unique museums on the Civil War with dioramas on the Gettysburg locations, with those kid friendly cat soldiers, of Pickett's Charge, Little Round Top, Meade's Headquarters, and Devil's Den. 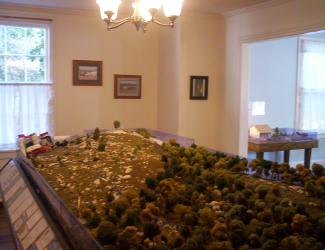 There are also dioramas on other Civil War sites, including Fort Sumter, and the battle of the Monitor and Merrimack. The museum in 2018 has now doubled its size and is now accessible for school groups. It is also handicap accessible for entrance and facilities. Monday and Tuesday: 11 a.m. - 8 p.m. Hours are shorter from December to March. Adults $6.50, Children 6-12 $5.00, 5 and under Free. So what else is there to see near the Civil War Tails Museum at the Homestead in Gettysburg. Well, directly across the street is the Gettysburg Tour Center, where you can get a dramatized or guided bus tour of the entire battlefield. Next door is the Eisenhower National Memorial headquarters and beyond that, within a couple hundred yards of the Civil War Tails front door, is the venerable gates of the Evergreen Cemetery, as well as the gates of the Soldiers National Cemetery. Evergreen Cemetery is the original cemetery that was there during the battle and site of the Gettysburg Address. The Soldiers Cemetery is the location that was built and dedicated by Abraham Lincoln six months after the battle where the soldiers of the Battle of Gettysburg are buried. 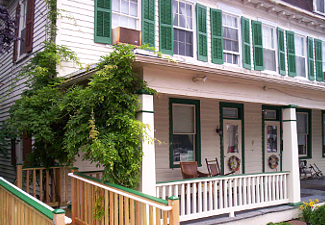 The Jennie Wade House on the north side of the Gettysburg Tour Center tells the story of Jennie Wade, who was the only citizen of Gettysburg who was killed in the battle. She was baking bread at the time. Down Baltimore street toward the Gettysburg National Military Park Visitor Center is the Military Museum, this often overlooked museum takes a broader view of military history than just the Civil War and includes artifacts and exhibits on other conflicts in USA history. The Gettysburg National Military Park Visitor Center is located one half mile down the street from Civil War Tails at the Homestead. Ranger tours, the Museum, Movie, and Cyclorama are all within the visitor center. Yes, there is a connection to cats and the Gettysburg battlefield that ties into the Civil War Tails take on Gettysburg history. Josphine Miller (Rogers) Slyder is pictured above years after the battle with her feline. And who is Josephine Miller? Well, outside of Jenny Wade; she's probably the most famous female (not feline) citizen of Gettysburg, even though her story has not been told, hardly at all really, for decades. Josephine Miller was the granddaughter of Peter Rogers, who owned a farm along Emmittsburg Road north of the Sherfy Farm, site of the famous Peach Orchard. The farmhouse and all buildings are gone now, although a white picket fence and one stone of the foundation still exists. This was the location of the first shot of the bombardment of Pickett's Charge and was fought over constantly on the 2nd and 3rd day of the fighting. 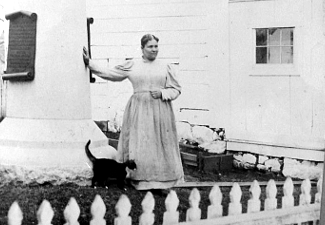 When the Union came to the Rogers farm and said that the family should leave, Peter Rogers wife Susan said yes, but the rest said no, including twenty-seven year old Josephine, who was baking bread at the time and was willing to feed the men of the 1st Massachusetts Regiment. She continued to bake bread during the entire fight, even convincing soldiers to requisition more flour from the quartermaster so she could continue her task to feed the soldiers. It was a heroic gesture under fire from the enemy in an advanced position. 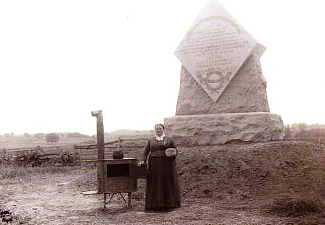 After the war, Josephine married a Slyder in October 1863 and moved to Ohio, but was so well thought of by the men of the 1st Massachusetts regiment, that they paid for her to return in 1886 when they dedicated their monument and took the famous, or should be famous, photo of her standing next to a baking stove near the monument to represent her contribution. Photo above right. But that contribution was not only indicated by a photo with a stove, a poem was written about Josephine Miller by Edgar Foster Davis of State College, Pennsylvania, and it goes like this. The war-cloud is gath'ring o'er Gettysburg vale. With the rushing of squadrons, - the loud trumpets blare. The clanking of arms, and the shouting of men. Josephine Miller is baking her bread. The wounded crawl into the cellar to die. No cry is unheard, but with tenderness rare. Josephine watches while baking her bread. Of Josephine Miller while baking her bread. In its pitiless wrath o'er the land and the deep. While Josephine Miller is baking her bread. Watch the great series of short videos done by the Programming Corporation of America about the museum. Civil War Tails Videos. Civil War Tails getting noticed! Washington Post article highlights what might be "America's most whimsical war museum." 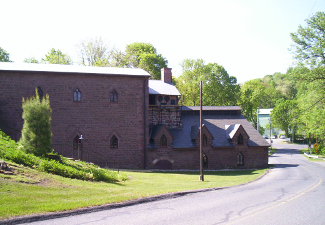 Cornwall Iron Furnace, Cornwall, Pennsylvania. 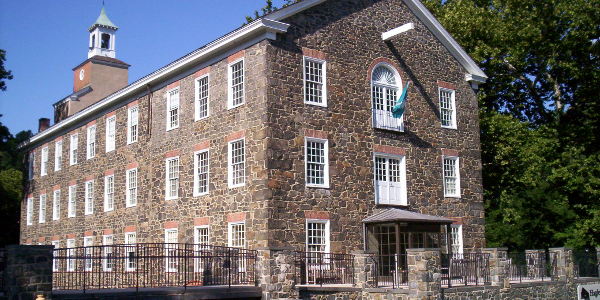 Hagley Museum, DuPont Ancestral Home.